"CEO Steve Ballmer on Thursday told financial analysts they should temper their expectations when it comes to sales prospects for Windows Phone 7, seen by many as Microsoft's last chance to become a player in the Apple- and RIM-dominated U.S. smartphone space. 'A number of you had a chance to kind of ask me a question ... which is how are we going to do,' Ballmer told the analysts, at Microsoft's Redmond, Wash. headquarters. 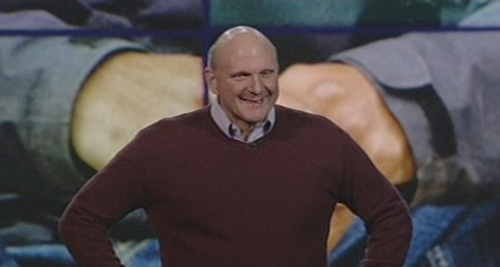 'And I think it's fair to say we've got a lot of work to do,' said Ballmer." Steve B's reservations come at a time when the last possible thing Microsoft wants to do is appear too confident. It's a fine line to walk, but I think they're playing it well: "We're confident in our product, it will speak for itself, we aren't going to make wild speculations." Are you reassured, or do you long for the Ballmer of the past? I prefer the old line "under promise and over perform" and I hope that Steve is following that maxim. How Steve still has a job is well beyond me. The last 5 years have been brutal for MS and they are losing market share like crazy. Vista was a flop, they let their smartphones get overtaken by Apple and Google and I'm afraid WM7 will be behind the curve when it comes out. MS needs new blood to keep up with the rest of the world. I tend to agree with Omegajb. I've been a big MS supporter for years. But Vista was terrible. Winmo OS is filled with bugs. Anyone remember the issues with Activesync they had? They have such talent and funding, I don't understand how they let this happen. How does one introduce a new mobile platform without such basics as cut and paste? Then MS is arrogant enough to tell me that they won't upgrade my windows mobile OS. Google isn't doing that, once they have a new OS, then it goes to everyone. Apple still bothers me because it's so closely related to iTunes, but at least the interface is functional. I think they're playing it right this time. Microsoft has disappointed me many times revealing new technologies, only to have those technologies never see the light of day in good time, come out less than half baked and/or canceled altogether. And that's the LAST thing they need. I have to disagree with you on that point. I would hate to install the WP7 OS on a slower device and it run like crap, and then leave with the opinion that "WP7 is crap." MS played it right since the new OS requires a specific set of base hardware features that aren't available on even most WP6 devices today. Since the hardware of current/classic Winmo devices varies so greatly, they can't afford to run the risk of having problems making it work with various types of processors and on slower devices in general. My big thing is the limiting the # of physical hardware buttons available on front of devices. I'm going to miss having dedicated call/hang up buttons and additional button to configure for any other frequently used app. THAT was dumb move. I'm not suggesting MS push the new OS onto inferior phones, but it should be available. Particularly if I can install WP7 and if it's too slow or cumbersome on my existing phone, then I can reinstall the WinMo 6.5. I have to disagree with you on that point. I would hate to install the WP7 OS on a slower device and it run like crap, and then leave with the opinion that "WP7 is crap." Based on MS specs HTC HD2 should be perfectly capable to run WP7, besides the "three buttons" only spec of course. I am sure that, once Wp7 will be released, we will see it ported to exisiting devices with no issues. Last edited by Fritzly; 08-03-2010 at 11:35 PM..